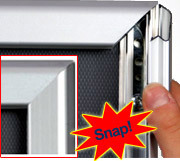 Snap Poster Frames : This poster stand combines a literature rack with a 22" x 28" graphic frame! 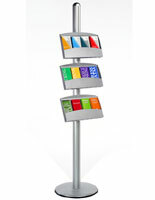 This BRAVA poster literature stand is perfect for lobbies and venues with large crowds! 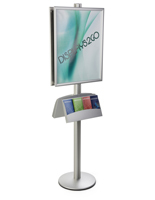 Standing an eye-catching 6ft tall, this poster literature stand will tower above other display stands and quickly draw attention to your exhibit. 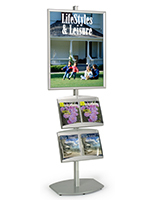 This poster literature stand comes with one 22" x 28" poster frame and one steel literature holder. Advertise your product, company or event with a large poster and then offer your customers promotional materials to take home with them. By using several marketing techniques at once, you can make more of an impact on your potential customers. Offered in a popular brushed aluminum finish, this BRAVA poster literature stand is a display fixture that will look great in a variety of different environments. Bring focus to your literature display stand with a large poster and then present your catalogs, manuals, and brochures for distribution. 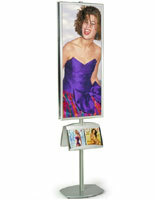 Both the poster frame and the literature dispenser attach to the pole easily and can be placed at any appropriate height. To attach these accessories, slide the connectors along the grooves. Adjust the accessory to whatever height you desire and tighten the screws. The literature tray holds 2 standard 8.5" x 11" brochures side by side. Made from powder-coated steel, the literature dispenser is durable and resistant to chipping or scratching. The poster frame also allows for quick and easy graphic changes once attached to the pole. Just snap open the sides, place your 22" x 28" poster inside and snap the sides closed. We sell this poster literature stand with lexan covers to protect your graphics inside the frame. Although it stands a towering 72" tall, this BRAVA poster literature stand is a sturdy unit that will not wobble or topple over. With a base weighing over 20lbs, a literature holder like this poster literature stand is difficult to move unintentionally. 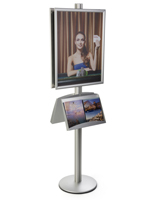 You can be sure your display will remain steadfast even in high traffic areas. We sell this poster literature stand with black plastic "feet" at the base to ensure that your floor will not be scratched. 23.8" x 72.0" x 17.0"
18.3" x 13.0" x 1.8"